The first childhood memories Todd Sheets has are of the original Batman TV series and the movie “Night Of The Living Dead.” Both would go on to truly have a large impact on his life. He would check out every book in the library he could find on Werewolves, Ghosts, Vampires, Bigfoot and UFOs. His love of all things dark, mysterious and scary grew with each passing year, and as Todd got older, he began making short films on Super 8 film with his Father’s old camera gear. The Horror bug had bitten Todd Sheets, and he knew that in his heart, he truly wanted to be involved in film. In 1989 Todd made his first feature film, in Kansas City, MO. He was told that no one makes Horror movies in Kansas City. He was told to stop dreaming and get a normal job. But through many trials and tribulations, he completed the film. Against all odds it seems, the movie got distribution worldwide, a fact Todd now regrets. It was a very raw effort but some could see the raw talent in the images onscreen. Todd almost gave up on movies after the experience, and after dabbling in small projects and doing some movies for fun with friends… he finally decided to give it another serious shot. Todd worked hard to learn his craft and finally began the production of Zombie Bloodbath in 1993. Taking the film to heart, and using the most of the resources he had... fighting to overcome the odds, including the greta Midwest flood of 93 that saw many locations underwater, the film was completed. Another battle had been fought and won. Though crude and low budget, the film showed an energy and enough skill to impress investors and distributors worldwide. The rest is history. With each film, Todd grew as an artist and has now won 7 awards and his films are available in many formats in over 80 countries worldwide. 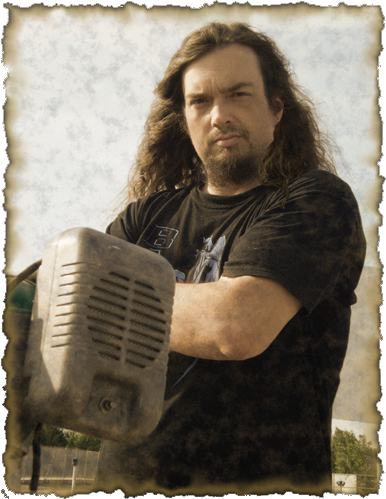 Todd also began working for a childhood friend, Dennis Kingsolver, designing and building one of the nation’s largest commercial haunted houses The Catacombs in 1996. Soon becoming a manager on duty and working at the location all year around, even though the attraction was only open to the public during September and October. The job was a dream come true for two reasons…. One, Todd was able to create an entire world of Horror and Nightmares and was able to be incredibly creative… and two, The Catacombs was in one of the most haunted buildings in the country. Actually haunted. A commercial haunted house that was housed in an actual haunted building. This would lead to many nights of research and investigating the building. The location truly made Todd believe that ghosts, or something supernatural, really did exist. Todd’s interest in music also collided with his love of the Supernatural and he and some friends formed Descension, a heavy metal theatrical band that has released 4 CDs and toured all over the USA, culminating an a huge show at the Milwaukee Metalfest, held in the awesome Sprint Arena in Milwaukee, Wisconsin. The band has also released several music videos and a DVD. They just finished their latest CD, “Kwaidan,” to be released in October 2010. Nominated as Best Midwest Metal band in the Pitch Music Awards for 4 years in a row, the band has gained a large and loyal fanbase thanks to their always over the top stage shows, mixing Horror, Special effects, props and characters into the music. Taking their cues from Kiss, Alice Cooper, Iron Maiden and newer bands like GWAR, Descension was yet another creative outlet for Todd to express his love of all things related to Horror. It was this love of Horror and scary things and his local status as a fairly well known semi-celebrity that brought a small local network KCHost to ask Todd to maybe do his own radio show. Todd had never done radio, so he turned it down. Several times. About a year after he was first asked to do it, and after e-mails back and forth with one of his personal heroes Art Bell, Todd agreed finally to try and do a show. But he wanted it to be not just about movies and TV – but about ALL things that go bump in the night. Taking inspiration from both Art Bell and George Noory and the “Ghost to Ghost AM” segment on the popular Coast to Coast AM Radio Show, Todd began the largest journey of his career. Radio show host. It was on this radio show that he met several people who opened doorways into other worlds and truly made a difference in Todd’s life. He went from being someone who read the books and watched the movies to being one of the people truly involved in the Paranormal. Turns out the show was produced at a perfect time. There were only a handful of shows dealing with the topic of the Paranormal at the time, before the popular internet radio boom and before TV had made the subject a “hot item.” The show took off and began to grow in listeners and popularity each week. Nightwatch quickly gained an army of affiliates as Todd began syndicating the show worldwide to AM and FM stations. Now the show is heard on 337 stations by over 1.5 million listeners a week. This soon led to the formation of The Nightwatchers, a nationwide, now worldwide, Paranormal group with over 3500 members. First of all - what is Nightwatchers? Well – as the show grew in popularity, Todd began getting hundreds of letters or messages a week asking how to get into the Paranormal as an investigator or how to find a group - some people had groups that burned them or were inactive. Some people had groups that had disbanded and were no more. Some were older investigators who just didn’t like some of the exposure that groups seek. Anyway, these letters made Todd think - wouldn't it be cool to have a place where ANYONE could go and do some investigations and share info. He talked to guests about it. He talked to groups about it. Everyone said how cool it would be. No one had thought of it or if they did, had not DONE it. A true huge, nation-wide Paranormal Group for people to be a part of that would be pro-active and positive and supportive. Many letters asked how small groups or individuals could get into the well known haunted locations to study and investigate without an established name, or without paying an extreme price that no one could afford. Now they can. Now all of this is possible. The Nightwatchers is for EVERYONE. All of YOU. Some have said "I want to join but I am part of this group and can't." WHY NOT??? The whole GROUP can join!!! Nightwatchers is about sharing information, learning together and working together in the field and online!!! Also – Nightwatchers do special trips to MAJOR haunted locations for the general public as well as investigators - these are real INVESTIGATIONS. And while Nightwatchers is free and does indeed have many free investigations, some larger places like Waverly Hills and such do require that each person pay a fee to investigate there. When the Nightwatchers do investigations, some of these places will give us a discount like the great LEMP Mansion did - while some just ask for a straight per person fee - EVERYONE pays the same - NO ONE makes any profit and Todd pays the same as anyone else to be there. Thanks to Nightwatchers, Todd has now investigated over 60 of the nations most haunted locations and continues to do so with various groups and individuals nationwide. He is working on his first book about the Paranormal now, produces 6 radio shows with Paranormal themes, continues to host Nightwatch as it grows and gets more and more syndicated distribution worldwide, has produced and released two DVDs filmed during various Nightwatchers Investigations and is now finishing a script for a new Paranormal movie to be shot in Spring of 2011. During 2010 and 2011 many of Todd’s Horror films are being remastered for DVD release in the USA. It is a very tedious project, but Todd himself is handling the new edits and transfers of the films to ensure the highest quality. Frame by frame the older titles are being restored and enhanced, in some places using newer digital technology to fix special effects or sections that just didn’t work due to lack of budget or time issues. The films are released worldwide through Pop Cinema label “CAMP Motion Pictures” out of New Jersey. In addition to keeping busy with all of these projects, Todd has been working with The Discovery Channel recently on a Top Secret project to be announced soon and Producers have recently contacted Todd about doing an original Paranormal show of his own for cable. Something kind of different and unique for 2011.